18 Mar 2019 --- Tyson Fresh Meats, the beef and pork subsidiary of Tyson Foods, Inc. has joined forces with IdentiGEN to use DNA technology to trace beef back to the individual animal of origin. The DNA TraceBack system is a tool to trace the cattle raised for Tyson’s Open Prairie Natural Angus Beef, proving exactly where the premium cuts of beef come from. This boost in traceability comes amid rising consumer demands for food transparency. While the technology is only being used for beef initially, the company is also exploring the use of DNA technology in other parts of its meat business. The process requires a small swab of the animal’s tissue, taken from the carcass at the beginning of the harvest process and uses “nature’s barcode” rather than a label on the package. The DNA sample from the cattle entering the Open Prairie program will then be used to trace the origin of individual cuts of beef as they move through the supply chain. The DNA TraceBack process assures customers that the Open Prairie beef products they buy were sourced from ranches where the cattle were raised to meet specific requirements, such as no antibiotics and no added hormones. “Our collaboration with IdentiGEN is about meeting that growing demand for transparency, providing our retail and foodservice customers with scientific evidence that they’re getting high quality, natural beef from animals raised the way Tyson Foods has promised,” he says. 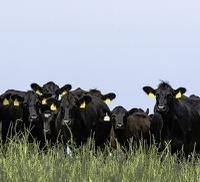 The beef industry begins at the farm with the growing and feeding of the cattle and then moves through a supply chain for processing before it reaches the consumer. “Traceability back to the farm of origin can be difficult. This DNA program is the most advanced meat traceability system available and uses nature’s barcode to link meat from the point of sale back to the source,” Harrison claims. “It will enable retail and foodservice customers of Tyson Foods’ Open Prairie brand to confidently share their traceability story with shoppers,” he adds. The Open Prairie brand is continually expanding to meet the growing demand for the natural beef line, says the company. In addition to no antibiotics or added hormones, the product specifications – which are third-party verified – include no artificial ingredients, 100 percent vegetarian diet, traceability to the birth ranch, Angus beef and rigorous animal welfare standards. Cattle for the program are raised by independent ranchers, mostly from Montana, North Dakota, Oregon, Washington and Nebraska. The beef is produced by the Tyson Fresh Meats plant in Lexington, Nebraska. IdentiGEN is a provider of DNA identification solutions to the international agri-food industry with laboratory operations in the US, Ireland, the UK and Europe, and the company headquarters are in Lawrence, Kansas. Its DNA TraceBack is different from other traceability methods as it traces the DNA in meat and fish – not barcodes, RFID labels, or paper records – to verify the exact origin of products. With DNA TraceBack, the product is the label linking meat and seafood in supermarkets and restaurants back to the exact animal or broodstock. DNA is tamper proof and permanent, making it a foolproof way of tracing food from source to fork, notes IdentiGEN. This kind of advanced level of supply chain transparency helps verify product claims and can be used to market retail and meat brands with greater confidence to consumers. The technology is being increasingly used to facilitate traceability, giving consumers greater visibility over where their food comes from, how it’s been processed and what it has been in contact with. Food transparency remains one of the hot topics for 2019 and the advances in traceability technology are helping companies satisfy the growing demands from consumers about where their food comes from – a trend that is only likely to become more prevalent in markets around the world. Advancements in technology include the use of blockchain, which is increasing in the food industry because it offer greater visibility over where food comes from, how it’s been processed and what it has been in contact with. Blockchain, therefore, has the potential to play a key role in protecting food integrity. You can read more about how blockchain technology is being adopted by key players in the food ingredients industry in the March edition of The World of Food Ingredients.